If your Instagram feed has been looking a little lacklustre lately, we have a surefire cure: take a bubble bath in a five-star hotel next to a pair of three-year-old Bengal tiger brothers. Yes, we’re serious. This is a real, actual thing you can do, and no, not in a Lil’ Wayne clip – at Jamala Wildlife Lodge, inside Canberra’s National Zoo & Aquarium. 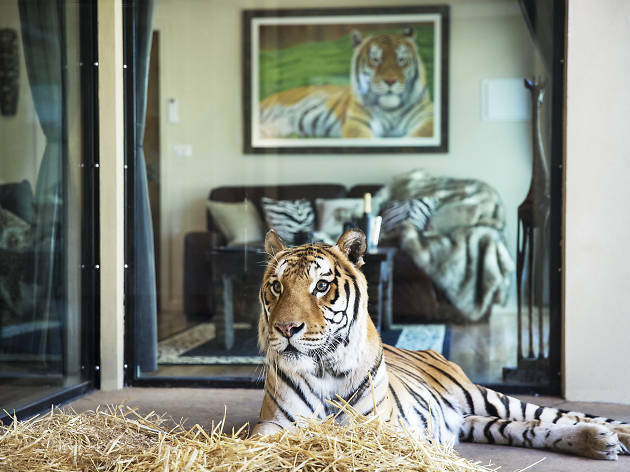 In addition to blowing your tiny mind forever (you can lie on the floor and pretend to spoon the tiger through the glass because no one is watching you – just the tiger), a stay at the Lodge will help support the Zoo’s conservation efforts. An overnight stay comes with all the behind-the-scenes perks you’d hope for from a sleepover at the zoo. These include an afternoon tour (where your host might drop fun little tidbits like “several of our female lions are on birth-control implants”); pre-dinner drinks featuring Moët, canapés and a pair of surprisingly adorable hyenas snacking on bones nearby; and the chance to wander through an eerily lit aquarium after hours. There’s also a morning tour where you can hand-feed deer and throw edible puzzles to capuchin monkeys. 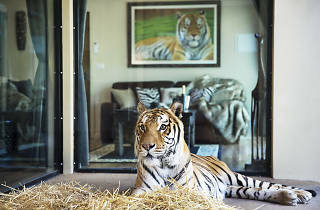 There are three accommodation options at Jamala: the UShaka Lodge, which feels the most like a luxury hotel (except that there are lemurs on the pool deck, and some of the rooms look into giant aquariums); the Giraffe Treehouses (which, as the name suggests, overlook a giraffe enclosure – you can feed your new friends from the balconies); and the Jungle Bungalows, which are private suites located around the zoo, built right into the enclosures of apex predators like lions, tigers and bears. They’re decorated with an African theme – not that you’ll notice, you’ll be way too busy staring at your deadly roommate. Jamala will take care of dinner – a three-course, loosely South African-inspired meal, with wines from Cloudy Bay and Leeuwin Estate – and breakfast, both buffet and à la carte, on your stay. But you didn’t come for the food, you came for the animals. This is a once-in-a-lifetime experience, and priced accordingly. But for that money you, and the animals you’re hanging with, will be very well looked after.